Gardens in Savannah. Photo courtesy of www.myhsf.org. Get an insight into great Savannah homes during the Home Tour. Photo courtesy of www.myhsf.org. Taking a tour of one of Savannah’s historic homes. Photo courtesy of stayinsavannah.com. There are both national and local events being held in Savannah nearly every weekend of the year. 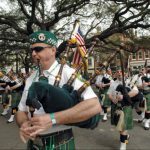 Last weekend was the excitement and fun of the St. Patrick’s Day Parade that wound through the squares and streets of historic downtown Savannah. This coming weekend you can get a chance to tour some of the historic homes and buildings that were along the parade route. Savannah has the largest urban landmark historic district in the United States. There are 2.5 square miles of parks, squares and homes. Savannah was found in 1733 by General James Edward Oglethorpe. He designed the city to be a grid of residences and broad boulevards with spacious squares. Because of his plans, Savannah now has 21 oak canopied squares surrounded by historic homes, with some homes dating back over 200 years. 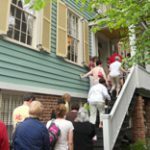 The 78th Annual Savannah Tour of Homes is March 21st to March 24th. 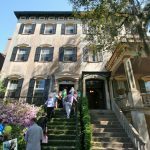 The event allows the public to visit some of Savannah’s finest private residences and admire rare furniture and decorations that have been in families for generations as well as tour beautiful home gardens. The tour is a self-guided tour of 6-9 different sites over a 3 hour period. There are also historical time period (Revolutionary War to Civil War) specific tours and tours of Bonaventure Cemetery. There are special seminars that are held over the 3 days of the event. The tickets go very fast, so order them today to be able to see living history in Savannah. Savannah is known around the world for its history and architecture. It is considered a great vacation spot for romance or for the entire family. 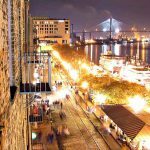 There are so many things to do and see in Savannah from going to the beach to visiting historical forts to dining at well-known restaurants. The well-preserved historic downtown district is a destination for every visitor to the city. Stop N Stor is very proud to be a member of the Savannah community! 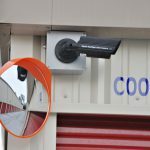 Stop in to our Savannah location to see how we can help you in your storage needs. Savannah is a city of many different festivals from food to music to film, Savannah has it all to fit any cultural taste. 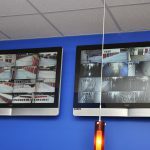 There are many great musical performers that come from the city as well as great regional and national acts that stop by to perform at many venues throughout Savannah. Last week, Savannah hosted the Stopover Music Fest to showcase bands that were on the way to performing at SXSW in Austin, Texas. The festival had over 100 bands play in venues over a 3 day period. Savannah hosts a Jazz festival in the fall and the Savannah Music Festival each spring. 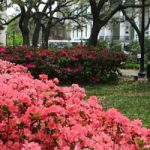 The Savannah Music Festival starts March 21st and runs through April 6th. The mission of the music festival is to “create timeless and adventurous productions that stimulate arts education, foster economic growth and unite audiences in Savannah”. The festival, which is celebrating its 24th year, is the largest musical arts event in Georgia. The Music Festival will showcase all types of musical genres from Bluegrass to Jazz to Classical to R & B to Zydeco to Rock N Roll during the 2 weeks of performances. Performers include: Dr. John, Sea Wolf, The Wailers, Portuguese Folk Singer, Fado & Soul of Southern Europe, Emily Lou Harris and Rodney Crowell, Marcus Roberts, The Atlanta Symphony Orchestra, Old Crow Medicine Show and much more. The performance venues are a perfect setting to hear great music. There are events being held at the following venues: Christ Church Episcopal, Lucas Theatre for the Arts , Ships of the Sea North Garden, Trinity United Methodist Church, Charles H Morris Center, Trustees Theater, Johnny Mercer Theater and Temple Mickve Isreal. The Savannah Music Festival is a non-profit organization that is dedicated to growing audiences of all ages through engagement with the musical arts. The festival produces youth concerts lectures a weekly radio series and high school jazz band competition. You can help support the Savannah Music Festival in many ways-including attending different events during the two weeks of the actual festival. They also hold other fundraisers such as the 10th Annual Golf Benefit on May 6, 2013 at Belfair. If you want to hear something a bit different, then check out all of the performers at this year’s Savannah Music Festival, you just might discover a type of music that you had never heard before. Stop N Stor is very proud to be a part of the Savannah community and supports the many festivals and events in the city. The Girl Scouts was founded by Savannah resident, Juliette Gordon Low in March, 1912. This organization has influenced more than 50 Million people since its inception 101 years ago. The Girl Scouts are celebrated during Girl Scout Week, which is every year during the 2nd week of March. During Girl Scout week, Girl Scouts are encouraged to attend a place of worship and be recognized as a member of the organization. If the church actually sponsors a Girl Scout Troop, the girls are encouraged to be a part of the service by carrying the flag or giving the greeting. During Girl Scout Week, many Girl Scouts will be traveling to Savannah to visit the birthplace of Juliette Gordon Low at 10 E. Oglethorpe Ave. The home is owned by the Girl Scouts of the USA to continue on in the spirit and vision of the founder. The Girl Scouts purchased and restored the home in 1953 and the building became a National Historic Landmark in 1965. There are daily tours of the home throughout the year with special programs being held during Girl Scout Week. However, the building will be closed during the St. Patrick’s Day parade on March 16th. The Wayne Gordon House was built in 1821 and is part of Savannah’s historical district. Juliette Gordon Low’s ancestors were very influential in industry and politics. The home is currently set up as the year 1886. It is furnished with traditional and family pieces from that time as well as 19th century decorative art. The house also has a Girl Scout museum and showcases family heirlooms as well as Juliette Gordon Low’s artwork. Juliette Gordon Low was a woman “ahead of her time”. She lived in Savannah as a child and later returned there after her husband passed away. She helped her mother start a convalescent home for soldiers during the Spanish-American War and was a well-known painter. Mrs. Low met Sir Robert Borden Powell, founder of the Boy Scouts and Girl Guides in 1911 and she became very interested in this youth movement. In March, 1912, Mrs. Low gathered 18 girls from Savannah to register for the American Girl Guides. The name was changed to the Girl Scouts in 1913. Because of disabilities, deafness, cancer and back issues that Ms. Low had throughout her life, she created the Girl Scouts to be an organization that welcomed girls with disabilities. The Girl Scouts would welcome girls of all backgrounds into the outdoor by giving them the skills to develop self-reliance and resourcefulness. These skills then are very helpful as girls become women and decide their career path. Savannah is filled with many historical buildings and historical personalities. Juliette Gordon Low is celebrated every day for her wonderful contributions to the word by creating the Girl Scouts. Stop N Stor is very proud to be a member of the Savannah community and share in its history. We are happy to share stories and information about this grand city on our Facebook page, Twitter page and this blog. Greening of the Fountain at Forsyth Park. Photo courtest of www.jax365.com. Drum and Pipes in the parade. 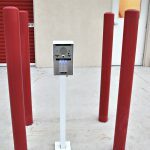 Photo courtesy of jacksonville.com. River Street in Savannah celebrates St. Patrick’s Day. Photo courtesy of startgeorgiabusines.com. 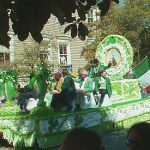 One of the many floats in the St. Patrick’s Day parade in Savannah. Photo courtesy of creativethinersintl.ning.com. Savannah hosts one of the biggest St. Patrick’s Day celebrations in the world every year. Last year, nearly one million people, both locals and visitors, joined in the celebrations in historic downtown Savannah. This year’s festivities could be just as big! The city has been celebrating its Irish Heritage since 1813! There are many activities that are a part of the St. Patrick’s Day festivities in Savannah. The events started in February with the Irish Heritage Festival . This 3 day celebration showcased the best in Irish music, dancing and food. 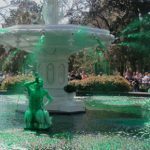 The “official” St. Patrick’s Day festivities kick off on Friday, March 8th at noon with the “Greening of the Fountain” at Forsyth Park. This event officially starts the week of activities before St. Patrick’s Day. Saturday, March 9th is the Tara Feis from 11am to 5pm at Emmet Park. This free family friendly festival includes live musical and dance performances, food, art and crafts. Another family friendly event that is taking place on March 9th is the Tybee Island Irish Heritage Parade. The 11th Annual parade starts at 3pm at City Hall and the route runs down Butler Street to Tybrisa Street. The St. Patrick’s Day festivities will be held on Saturday, March 16th this year. The day starts off with an 8am Mass at Cathedral of Saint John the Baptist in Savannah. The 189th Annual St. Patrick’s Day Parade starts at 10:15am and winds through the historic downtown district. There will be over 350 units in the parade including dignitaries, marching bands, military bands, pipe and drum corps, the Budweiser Clydesdale horses, floats and more. Everyone comes to the watch the parade dressed in their Irish “finest”. It is just as fun to people watch as it is to watch the parade! River Street is hosting their annual St. Patrick’s Day Celebration on the River starting on Friday, March 15th. The celebrations have gotten so big that the streets will be closed downtown from River Street to Broughton Street. The streets will be filled each day with food, music and other entertainment. Stop N Stor is happy to be a part of the Savannah community. Enjoy the St. Patrick’s Day activities in the great city of Savannah! Slainte!